Wolverine either hates or loves fire. Humberto Ramos has taken over the artistic duties on the new "Big Time" Amazing Spider-Man storyline and seems to have surged back into the Marvel spotlight. 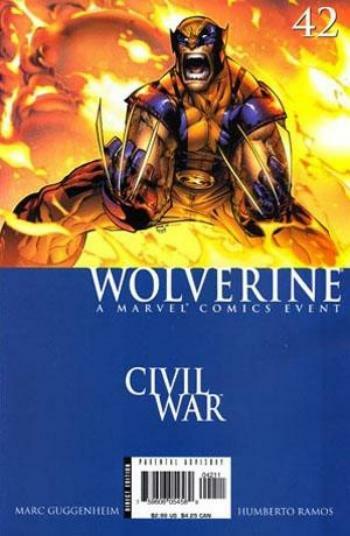 Ramos had a short stint with a mainstream Marvel character back on the third volume of Wolverine. His exaggerated and, at times, over the top style when it came to muscles and overall body types seemed to fit with the energetic and action oriented Wolverine series. Ramos marked his first appearance on the title with Wolverine #42. The comic of the day has Wolverine hunting down the super-villain Nitro after he blew-up a school, killing many innocent children. Wolverine sets out to return the favor. The Ramos run is a tie in to Civil War, which stems from the Nitro incident. The Civil War connection brought attention to Wolverine which had been dipping in sales and was going through a transitional period. Personally I loved the art of Humberto Ramos after reading Wolverine #42. The style fits the character perfectly...for a while. As I mention about Ramos in the past, his art is a great change of pace to more popular realist styles but can wear on your eyes after a while. By the end of his Wolverine run I was ok with not seeing Ramos' art (for several years) until recently with Amazing Spider-Man, where I welcome it once again for a 5 to 6 issue run.